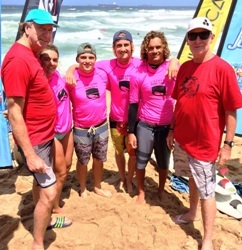 Wave Wizards Surf Club, in association with Surfing South Africa, hosted a two day competition on 13/14 December which kicked off the annual Umhlanga Summer Festival. There were a record number of entries with close to 150 surfers taking part in a range of age divisions from Masters to Novices as young as 5 years old. The conditions were very tricky, yet contestable with strong NE gusting winds which made it difficult for many surfers to choose where to surf as it was peaking in all different areas. Craig Daniel obliterated his competition in the longboarding men’s final posting two scores in the excellent above 8 point range. Second was Scott Lefevre, followed by Grant Gilmour and Jago England. In the Open Ladies, it was Sarah Baum who got the highest scores with a pair of 7’s, beating Nicole Pallet in second and Chanelle Botha and Teal Hogg in third and fourth respectively. The Open Men saw a clean win by Casey Grant from Scottburgh when he turned on the heat with two top scoring rides to beat WQS campaigner Davey Van Zyl in second, Chad du Toit in third and Richard Kidd in fourth. The Tag Team event was the highlight of the competition and had five rival surfing teams from along the KZN coastline going head to head. Beyrick de Vries was the star performer for the Wave Wizards Surf Club posting a 9 and 8.5 point ride to give his team an early lead. There was lots of tension towards the end of the hour long heat when Durban’s North Swell Surf Club came back strong to give Wave Wizards some serious pressure. Devin Lane was the hero at the end of the heat when he just got the score to take the team to a narrow victory of less than one point. Derek Watts from Carte Blanch was seen at the competition sporting a Wave Wizards T shirt and cheering for the local club. The winning team pocketed R10 000 cash from Just Juice.